Large - $80.99 Only 2 left! You know that feeling when you wake up from a super long nap and you feel like you're waking up in a new century? The sun is in a new position and your head feels like it's full of cobwebs. Well, this witch has been seriously dozing for the last hundred years so we can't imagine how she's feeling. She sure looks snappy, though. A simple cup of coffee isn't going to clear this lady's serious case of grog. She needs something stronger. Something with a little more punch that will put the pep back into her step. Something that'll dust the grave dirt from her hair and put the color back into her cheeks. Hmm, is that children we smell? This dress is fun, playful, and a little bit ragtag. You'll love the crinkled red and gold panel in the front. The side panels are of a soft purple material and are fitted with a little peplum around the hip. The bodice is made of a satiny material with structure in the pointed waist and a cheerful floral pattern. 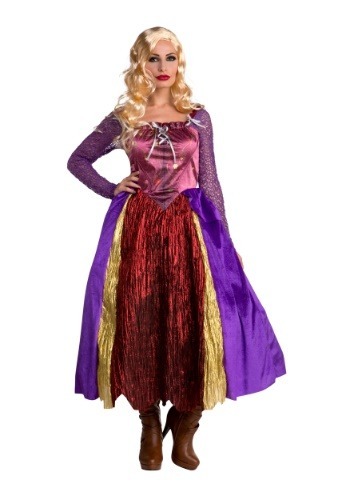 The sleeves are a purple crochet to highlight this costume's ragtag look. Pair this colorful dress with a curly blond wig to make your witchy look complete. Are you ready to let your wild spirit free? Jump on that broomstick and sing out into the moonlit sky. Dance around the cobblestone streets and charm the townspeople with your antics. Mix up some lovely potions for your friends. Everyone loves a green-hued swamp water martini, right? Well, we're sure they will drink it up when you make it! We have to say, we're pretty glad that you rose from the grave. After-life looks great on you. Just be sure to stave your appetite before heading out on Halloween night, kiddo toast simply isn't an option these days.